Somethin' about yesterday had almost every conversation leading into giving birth, kids, or something of the sort. First I had a dream that my mom had twins that were born from different sacs/wombs/whatever [How my brain came up with that in dreamworld I'll never know], then the oldest mom in Britain had a kid, my coworkers were talking about having threesomes with conjoined twins [Don't ask], and then I found all sorts of crazy, one in a million births. Basically... What I take from all of it.. Is that I should share some of these births from around the world. They amazed me, now you can be amazed. 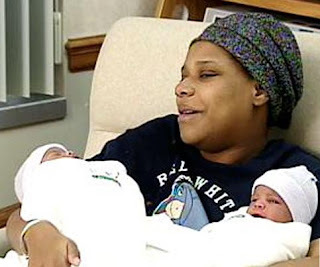 These are the biggest twins ever to be born in NC. One was 10 pounds, 14 ounces the other was 12 pounds, 3 ounces. Wowzers. I'd never have another child again. 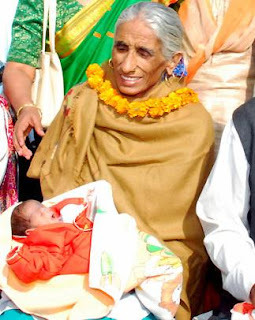 This lady gave birth to her 12th kid when she was 62. 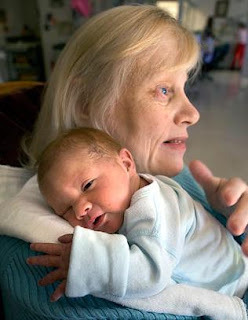 She already had 20 grandchildren and 3 great-grandchildren. That's just wrong. There IS a time to stop. Britain's oldest mom... She's 66. So she probably won't live to see her kid graduate high school. Awesome. These two twins were born a year apart! Well, 26 minutes, to be exact... But one in 2008, and one in 2009. That's just cool. They don't have to share a birthday cake! 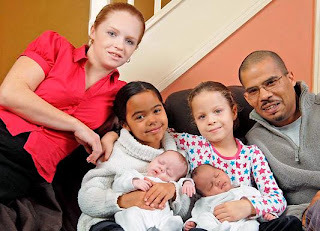 They had two sets of twins, and both times they came out as 2 different races. That's awesome, too. This is almost one whole family. That lady is holding her 18th child, while 16 of its siblings look at it like "not another one." They have their own show, but they should just go ahead and take over Jon and Kate's hour too, probably. I'll tell you what... Some of these, would be awesome to say happened to you. But if I wait 'til I'm 70 then decide to have a kid, someone throw me off a cliff. And if there is any chance I'm having 2 kids both over 10 pounds [Which unfortunately could be possible seeing as my brother was 10-6 and I was something around that, too. ], we better pull out those babies a couple months in advance.